Origins is an organisation that has been in existence for over 23 years. It was founded in 1995 by a group of Mothers who lost children to past adoption practices basically from the 1950s through to the later periods right up to and beyond the 1980s. Origins was formed to research the legal, historical and the social and psychological implications and side effects of adoption, such as, mental health disorders and other issues associated with child separation. Our research also comprises other elements: foster care; institutional care; and Aboriginal child removal. Origins is an international organisation with branches in the USA, Canada, UK, Ireland, and NZ. Origins has for many years had the opportunity at a representative national level to observe the issues of most aspects and effects of family separation. 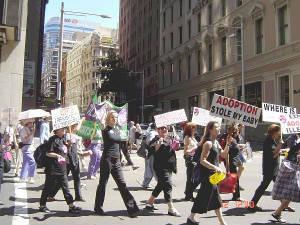 Origins believes that as an organisation it was fortunate to be in a position to be able to do that due to its commitment to advocating and studying the effects of adoption and child removal, based over the past two decades Origins has contributed to many Senate and Parliamentary inquiries, departmental consultations, academic research projects and exhibitions to name a few, and our extensive library focused on adoption and child separation issues.